When selecting plants for the perennial garden, a designer must take into account a multitude of factors beyond flowers. How will the plant look at each stage of its development? How much space will it take up? Will it bully its neighbors? Will its skeleton look interesting in winter? Because their foliage dies back and disappears, spring ephemerals relieve the designer of many of these concerns. Ephemerals are geophytes, meaning that they have an underground storage organ. Before the foliage dies back, the plant photosynthesizes enough sugars to sock away underground. This energy reserve enables the plant to reemerge the following spring. On the High Line the ephemeral displays begin in February and continue into May. 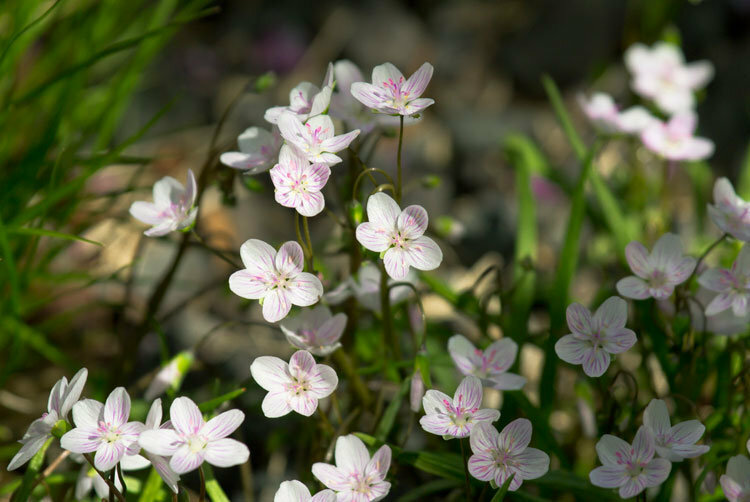 Some ephemerals, like the candy pink Lady Jane tulips are quite showy, while others, like the delicate twinleaf, might easily be missed if one is not looking closely. Many of the familiar spring ephemerals, like daffodils, tulips and crocus originated in Eurasia. However, there are several lesser known woodland species in our area that have been incorporated into the High Line plantings. These woodland ephemerals take advantage of the abundant sunlight before the tree canopy leafs out. 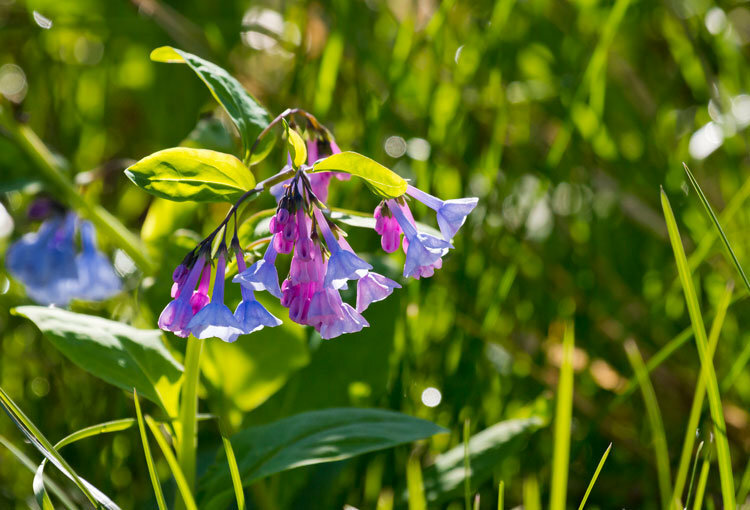 Virginia bluebells (Mertensia virginica) are named for the bell-shaped flowers which begin nearly fuchsia before deepening to a blue that is rarely seen in wild plant species. In April, colonies of thousands of Mertensia virginica can be seen carpeting the rich flood plains of the eastern United States. In the park, they are planted in sweeps through the Gansevoort Woodland, where they look right at home among native sedges. Twinleaf (Jeffersonia diphylla), also in the Gansevoort Woodland, is equally stunning. Each Jeffersonia flower lasts for only a day. Right before opening, the flower bud swells into a glossy white pearl, upheld on a slender stalk. 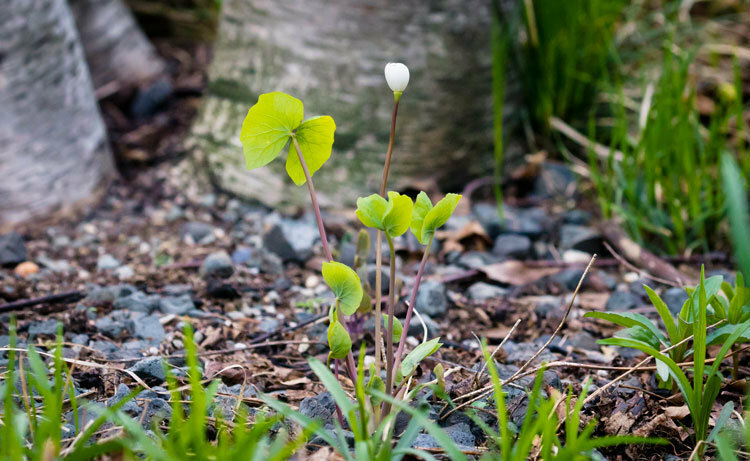 Though the Jeffersonia have finished flowering, their foliage is still worth a closer look. The two leaves connect, making them look like a pair of wings. Officially, spring stretches deep into June, but perhaps it is the ephemerals that make this season feel so fleeting. This post was originally written by Erin Eck.